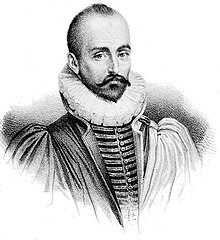 Michel de Montaigne (Michel Eyquem, lord of the manor of Montaigne, Dordogne) (28 February 1533 – 13 September 1592) was an influential French Renaissance writer, generally considered to be the inventor of the personal essay. Si on me presse de dire pourquoi je l'aimais, je sens que cela ne se peut exprimer qu'en répondant: parce que c'était lui; parce que c'était moi. What the earliest utopians — Montaigne, Thomas More, Tommaso Campanella — understood was that they fought not for a place but for a new set of ideas through which to recognize what would count as Real: Equality, not hierarchical authority. Individual dignity, not slavish subservience. Our preeminent problem is that we recognize the Real in what is most deadly: a culture of duty to legalities that are, finally, cruel and destructive. We need to work inventively — as Christ did, as Thoreau did — in the spirit of disobedience for the purpose of refusing the social order into which we happen to have been born and putting in its place a culture of life-giving things.